In just it's 5th season, Mill City Summer Opera has become hugely successful, with six sold-out performances of fantastic outdoor opera in the spectacular location that is the Ruin Courtyard at the Mill City Museum. 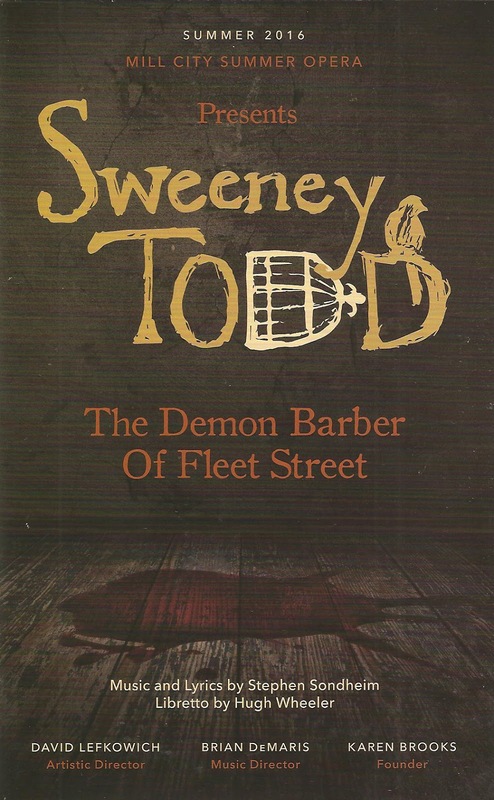 And even though this year's selection, Stephen Sondheim's Sweeney Todd: The Demon Barber of Fleet Street, isn't technically an opera, it works beautifully performed by this 30+ member opera company (and orchestra of nearly that many) in this unique location. Only one performance remains, but tickets have been sold out for months, so watch their Facebook page in early 2017 for the announcement of next year's show, and get tickets early! 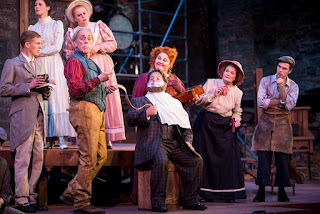 Mill City Summer Opera's production is on the opposite end of the scale from Theater Latte Da's beautifully stripped down production last year, which featured a cast of about a dozen and a four-piece orchestra. That was a sparse and gritty Sweeney, this is a full and lush Sweeney. Both takes work, and it's interesting to see two different interpretations of the same piece. In this production, the 30+ trained opera singers and an orchestra nearly that size (directed by Brian DeMaris, and managing to keep their instruments in tune in the 90 degree humid air) fill the courtyard with sound, bringing out the fullness in Sondheim's score. The leads are from the national opera scene, with a few familiar local faces in the ensemble. Robert Orth is a magnificent Sweeney, dark and powerful and yet somehow sympathetic. Catherine Cook brings humor and heart to the role of Mrs. Lovett, his partner in crime. Jeni Houser and Mackenzie Whitney are lovely as the young and naive lovers Johanna and Anthony, and David Blalock imbues Toby with childlike innocence and playfulness. Last but not least, Emily Pulley is truly creepy as the mysterious beggar woman, even as she walks through the crowd before the show begging "alms, alms, for the miserable woman!" The set is perhaps the best match to location I've ever seen. The rusty copper of the stage and aged smokestack so perfectly match the Ruin Courtyard that it's difficult to know where the set ends and the courtyard begins. In fact, throughout the first act I thought that the smokestack on stage was part of the ruins that they worked into the set; it wasn't until smoke started rising out of it in the second act that I realized it was actually part of the set, just made to match the old smokestacks sitting on the side of the courtyard. Director David Lefkowich makes great use of the space, with entrances and exits on all sides of the courtyard. Mill City Summer Opera has given an operatic twist to one of Sondheim's best musical theater scores. With a huge and talented cast and orchestra, and a set that perfectly matches the spectacular space of the Ruin Courtyard, this Sweeney Todd is a dark and thrilling experience. *Plot summary borrowed from my post about Theater Latte Da's production of Sweeney Todd last year.